Berkley G-163, 1958. Berkley G-163, first printing October 1958, in Very Good condition. 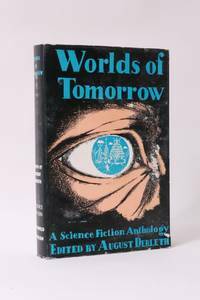 Cover art by Richard Powers. A Paperback Original.. Mass Market Paperback. Very Good. Four Square, 1967. Paperback. Good. 1967. 160 pages. Pictorial cover. Binding is firm. Light tanning, staining and thumb marking throughout. Mild page scuffing with some dog-eared corners. Paper cover has mild edge wear with light rubbing and creasing. Some light marking. Berkley, 1953. Book. Near Fine. Soft cover. First Ed. 1st paperback edition. Near fine condition, very slight overall wear, small amount of wear to upper and lower ends of spine..
WORLDS OF TOMORROW - Exploring the Vast Boundaries of Space and Time with Top Science Fiction Writers. - with 10 Short Stories..
Great Britain, United Kingdom: Four Square Books., 1963. 160 Pages; > Front cover crreasing at spine; store stamp to interior backcover.. Second Edition. Soft Cover. Very Good. Illus. by Mortelmans Painted Cover!. 12mo - over 6¾" - 7¾" Tall.. Mass Market Paperback..
Four Square, 1963. Paperback reprint. One slight internal split. All else Good.. Soft Cover. Fair. Four Square, 1967. reprint. softcover. Fair/Good.